Strawberry Colada Cake with Coconut Buttercream is like a celebration of summer in every bite! Tender layers of strawberry cake sandwich a lush coconut buttercream filling, packed with fresh pineapple and strawberries. All enrobed in more coconut buttercream and dusted with shredded coconut. 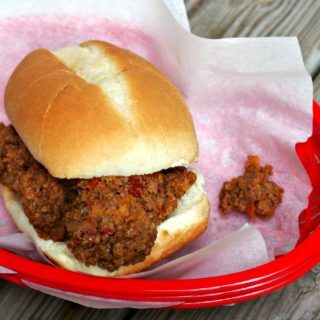 Have you every run across a particular food that makes you smile ear-to-ear at the thought of it? 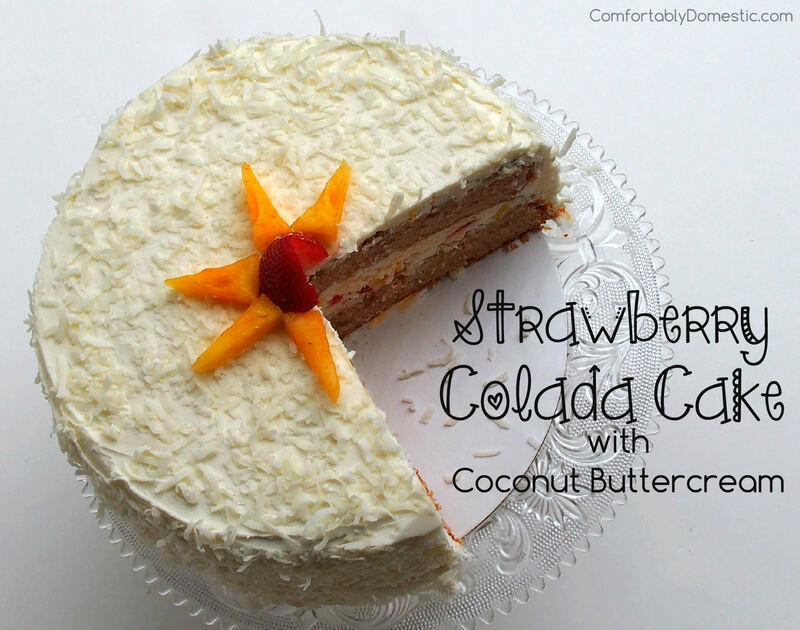 Strawberry Colada Cake with Coconut Buttercream is that happiness-inducing foodstuff for me. Every time I think of this cake, I can’t help but get a Cheshire Cat-like grin on my face. Fresh summer strawberries make me happy. Pineapple and coconut make me happy. Coconut buttercream frosting makes me really, really happy. This cake? Makes me really, really, really happy. Strawberry Colada Cake is real strawberry cake that’s layered with a seriously awesome filling of ripe, juicy strawberry and pineapple bits combined with a velvety coconut buttercream. As if that weren’t enough, the cake is then enrobed in more coconut buttercream before being sprinkled with sweetened coconut flakes. I mean, come on! If this cake doesn’t bring a smile to your face, then I’ll have no choice but to hang up my Holstein cow print apron and admit defeat. If I can’t help you smile on a regular basis Friends, then I have failed you. But I have faith in both this cake and you! If the pretty exterior doesn’t sway you, then one bite of Strawberry Colada Cake with Coconut Buttercream Frosting will bring a special shade of happiness to your day. Then, I will have succeeded in sharing a little happiness. 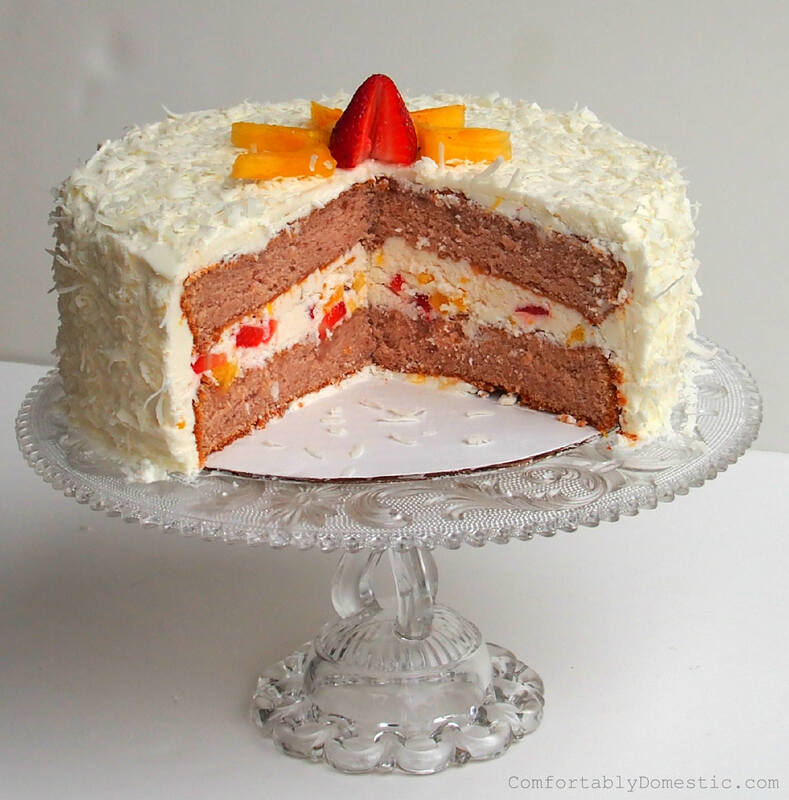 Tender layers of real strawberry cake sandwich a lush coconut buttercream filling that's positively loaded with fresh pineapple and strawberries. All of which is tastefully enrobed in more coconut buttercream and dusted with shredded coconut. Strawberry Colada Cake is like a celebration of summer in every bite! Preheat the oven to 350 degrees. Grease and flour two 9-inch round baking pans with baking lube , or spray well with baking spray. Cream the butter and sugar together in a large bowl until very light and fluffy. Mix in eggs, one at a time, until each are well incorporated. Stir in the vanilla extract. Whisk together flour, salt, and baking powder over in another bowl until combined. Gradually blend in about one third of the flour mixture into the creamed mixture until smooth. Then, with the mixer running on low speed, slowly pour in half of the milk mixture, mixing until just incorporated. Repeat the additions by adding another third of the flour mixture, followed by the rest of the milk, and ending with the last third of the flour mixture, stirring well between each addition until it comes together to form a smooth batter. Scrape down sides of bowl as needed during the process. Stir in the strawberry flavored gelatin at this time, if using. Increase the speed to medium and continue mixing for an additional 2 minutes to aerate the batter. Whisk the jam before gently folding it into the cake batter. Divide the batter evenly between the prepared cake pans. Bake the cakes in the preheated 350 degree F oven for 30 to 35 minutes, or until the centers are set. A cake tester inserted into the centers should come out clean. Cool for 10 minutes in the pans before turning the cakes onto wire racks to cool completely. While the cakes are cooling, prepare the frosting and filling. Whip the softened butter in a large bowl until very creamy. Blend half of the powdered sugar into the butter, until smooth. Stir in the coconut and rum extracts, as well as the pineapple juice. Blend in the remaining powdered sugar until a smooth but somewhat stiff frosting is formed. To make the filling, transfer one-third of the frosting to a small bowl. Fold the fresh pineapple and strawberry pieces into the frosting until the fruit is distributed throughout. Cover both the filling and the frosting until the cakes have cooled and are ready to be assembled. Level the cakes by slicing off the domed peaks so that the cakes are flat on both top and bottom, if necessary. Place one of the cake rounds onto a cake plate. Evenly spread the filling on top of the cake, leaving a half-inch clean border around the perimeter of the cake. The filling layer should be roughly equivalent in thickness to that of each layer of cake. Center the other cake round over the filling, gently pressing it downward to sandwich the filling between the layers. The filling should spread to the very edge of the perimeter of the cakes without protruding. Cover the exterior and top of the layer cake with the coconut buttercream. 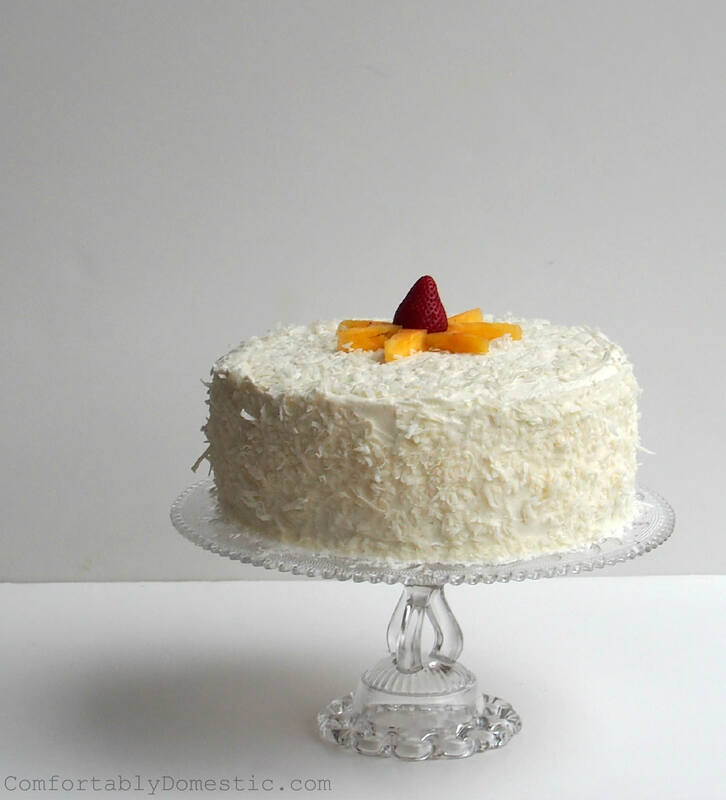 Carefully press the shredded coconut to the sides of the frosted cake to adhere. Garnish the top with a cut strawberry and additional pineapple pieces. Keep the cake refrigerated until about thirty minutes before serving. Allow the cake to come to room temperature for half an hour before slicing to serve. 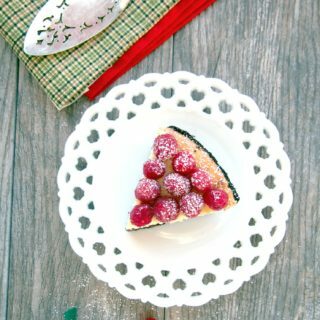 Leftover cake should be wrapped loosely in plastic wrap and stored in the refrigerator. If you love coconut desserts as much as I do, then be sure to check these recipes out, too! Classic Key Lime Pie with Coconut Whipped Cream. Could this cake be more beautiful?!? Can I have a slice for breakfast? oh man...I could eat that buttercream by the spoon full! Oh my goodness, ALL of those things make me happy, too! What a beautiful cake! Yay! Thank you! Cake is definitely happy food. If ever a cake recipe screamed summer, it's this one! Beautiful cake Kristen! My daughter would love this since is covered in coconut. Cakes always make me want to celebrate something! I'm not a huge frosting person, but I could seriously eat that filling with a spoon. I don't even want to begin thinking of the calories in this cake. It doesn't matter, I'd still want a second slice. Don't think about it for another second, Deanne. Just grab a fork! That looks gorgeous, what a cake! Thanks so much, Brenda! I feel like Charlotte saying, "Some Cake!" This cake looks delicious and beautiful,too! Why thank you! I love a pretty cake.